Sift together flour, sugar, and baking powder. Place in a mixing bowl. Use a pastry cutter to mix in shortening (or butter/shortening if desired). Mix marmalade, orange juice, and vanilla in a small bowl. Pour into dry ingredients. Beat eggs and pour into the bowl. Mix all ingredients together gently, using fewer than 10 large strokes. In a small bowl, mix topping ingredients. Fill muffin pans with batter. 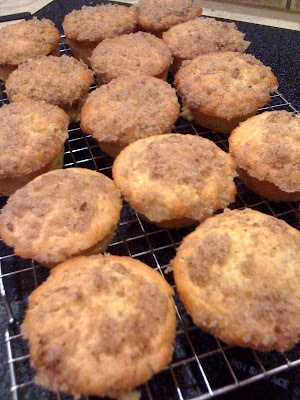 Sprinkle 1 heaping teaspoon of topping ingredients over each muffin. Sprinkle wheat germ over the top for extra crunch. Bake for 20 to 22 minutes until done. Remove from pan and cool on wire rack. Eat warm or at room temperature. I am visiting from Organizing Junkie and so far have three recipes bookmarked to try.